Large, bright and cheery, all our rooms are tastefully decorated with beautifully coordinated furnishings, well appointed and spotlessly clean! 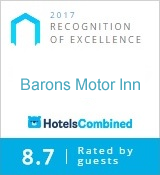 Clean, quiet rooms at affordable prices make The Baron Inn the first choice in town. Rates change throughout the year; please contact us to confirm your rate.